King Arthur Tools are known for their Lancelot and Squire chainsaw disc cutters, their Holey Galahad tungsten carbide discs, Guinevere sanding system, and the Merlin mini grinder - all products have a name associated with the Arthurian legend - all of which are designed to shape wood. Therefore, it should come as no surprise that these 100mm (4in) flap sanders have been introduced to shape and refine surfaces further. And for those who are interested, Igraine was Arthur's mother. 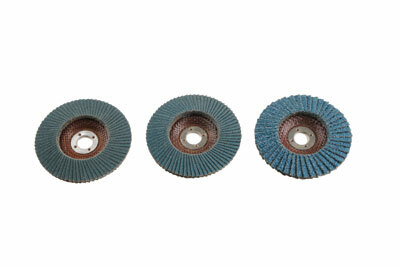 These discs measure 100mm (4in) in diameter and have a 22mm (7/8in) arbor hole; these are designed to fit on 115mm (4 1/2in) angle grinders. There are three grit grades available: 24, 60 and 80. They are easily fitted to the angle grinder and once secured, are ready for use. The coarse grit is able to remove wood very quickly and can be used to shape things with ease. 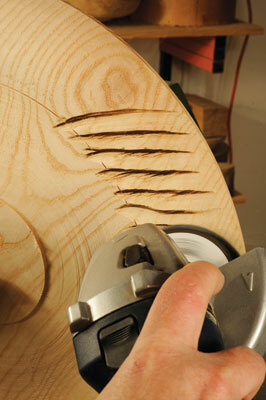 Above, you can see the tool being used to carve ridges on the outside rim of a platter. The circular shape of the discs afford you great control and they can be manipulated across the surface of the wood quickly and easily. Not only can you refine the shapes with these, but you can sculpt with them as well as using them to create incised lines, curved fissures and fish-scale details. They, of course, can be used with light or heavy pressure and this will alter the effect and surface finish achieved. One thing to note - and this has nothing to do with the efficacy of the discs - angle grinders can be quite heavy, so use the side handle as this will provide extra support and afford you more control. Ensure to take regular breaks so that you don't become tired. These products are perfect for people who wish to sculpt and alter shapes. They are definitely worth exploring; quite simply, the discs performed faultlessly when shaping and refining the surface. The Igraine disc was surprisingly easy to use, even with its fast waste removal. I felt totally in control of the angle grinder at all times, and there was absolutely no grabbing when cutting a depression in a piece of beech. The disc leaves small ridges after use across the timber. These would easily be removed with a powered sander, or even left in place for a pleasing decorative effect. In short, I liked it.